I am now carrying a new blanket style. It is more lightweight than the flannel and minky blankets (which are still available) but is just as soft and cuddly. The backing is super soft snow white chenille. 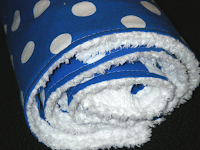 Blanket measures approximately 35"x30".